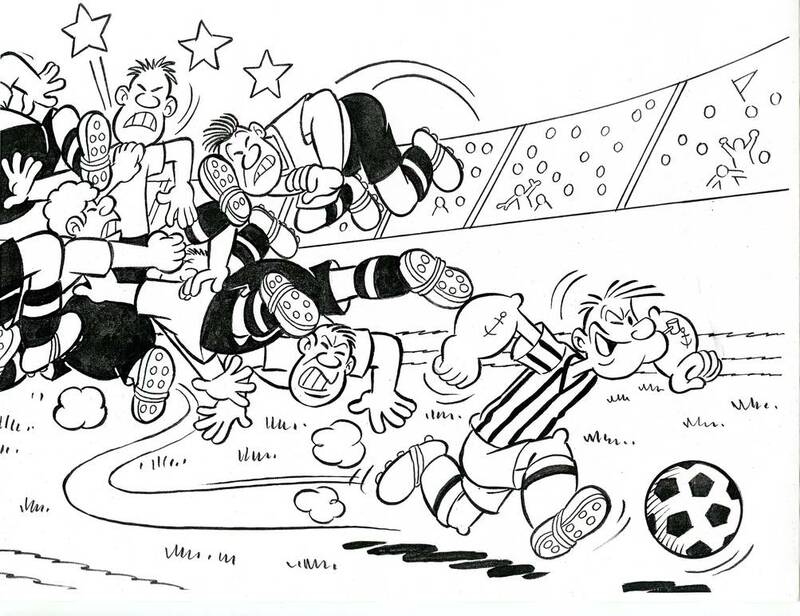 Sandro Dossi, one of Braccio Di Ferro's comic book artists, drew an exciting cartoon just for this article. Popeye celebrates his 90th birthday in 2019 having made his debut in E.C. Segar’s Thimble Theatre comic strip on January 17, 1929. The character was meant for only one story but newspaper audiences wanted to see more of him. When Mussolini came to power in Italy, he banned all American comic strips, but Popeye was so popular the Italians made him bring it back. While the one-eyed sailor has been extremely successful in the United States his popularity exploded in Italy. Popeye celebrates his 90th birthday in 2019 having made his debut in E.C. Segar’s Thimble Theatre comic strip on January 17, 1929. The character was meant for only one story but newspaper audiences wanted to see more of him. Segar soon featured Popeye alongside original cast members Ham Gravy, Olive and Castor Oyl. By the early 1930’s Popeye merchandise was lining store shelves. In 1933 Max Fleischer included Popeye, Olive Oyl and Bluto in one of his Betty Boop cartoons. The film was extremely successful and Popeye’s own theatrical series shortly followed. By the time production ended in 1957 two hundred and thirty- four cartoons were completed. When these same animated films made their television debut in September of 1956 Popeye mania was ignited. King Features Syndicate (and later Hanna-Barbera Productions) produced approximately three hundred additional Popeye cartoons for the small screen. A live action movie titled Popeye was released in 1980 with Robin Williams as the one-eyed sailor. The sailor’s success spread to Europe with hundreds of products flooding the Italian marketplace. 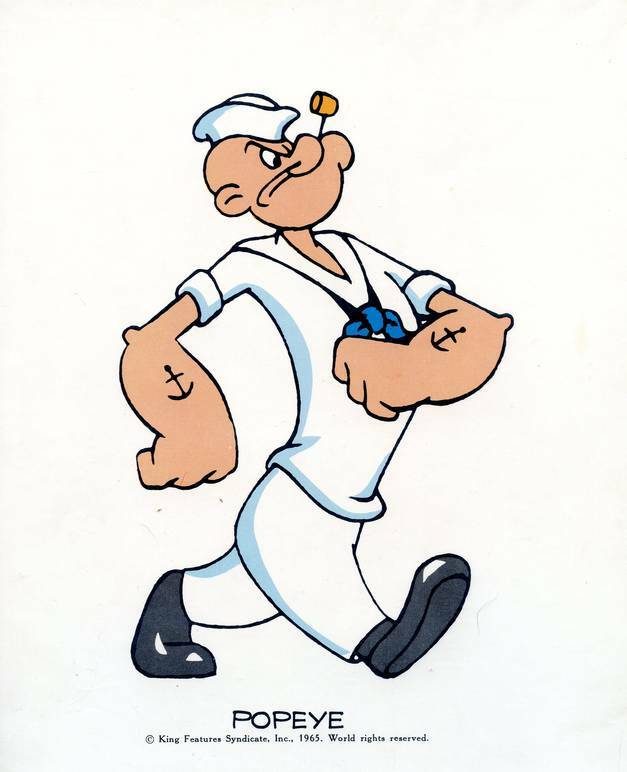 In Italy Popeye is often referred to as Braccio Di Ferro and his friends go by Olivia (Olive), Pisellino (Swee’pea), Poldo Sbaffini (J. Wellington Wimpy), Trinchetto (Poopdeck Pappy) and Eugenio il Gip (Eugene the Jeep). Popeye’s nemeses are La Strega del Mare (The Sea Hag) and Timoteo (Bluto/Brutus). 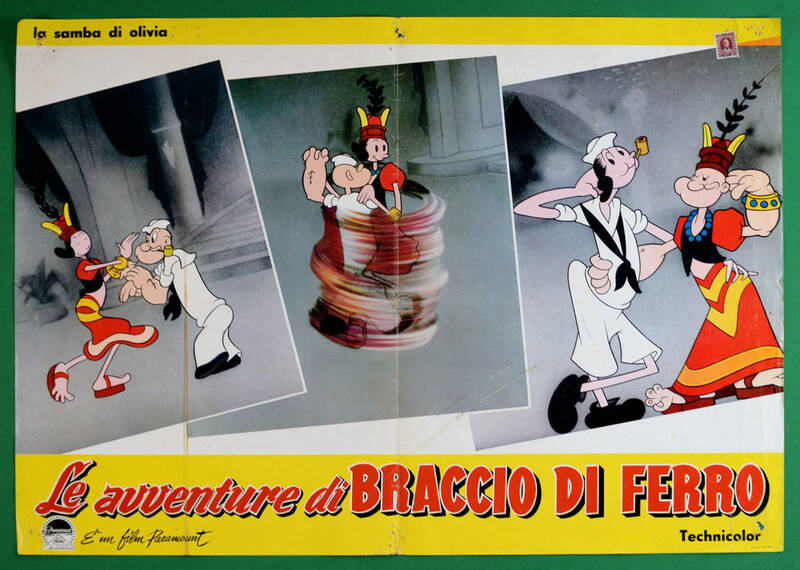 During the 1960’s Braccio Di Ferro’s exposure in Italy was heightened by the successful film, Le avventure di Braccio Di Ferro a complication of his theatrical cartoons produced by Paramount Pictures. When Hy Eisman, who produces a new Popeye Sunday page, visited Italy he was mobbed by fans when word got out, he was the man behind Italy’s famous spinach-eater. According to Braccio Di Ferro historian, Lorenzo Terranova, from 1963 to 2000 approximately a thousand comic books containing original material written and drawn by Italian artists were published in Italy, plus thousands of reprints of the same material. E.C. 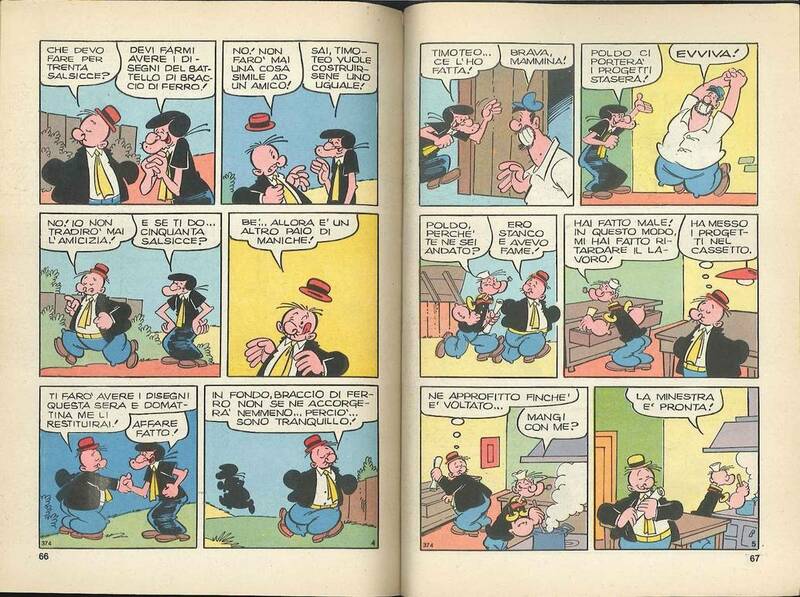 Segar’s comic strips have been reprinted in Italian several times. Most recently La Gazzetta dello Sport published sixty outstanding books reprinting not only Segar’s work of his successors; artists Doc Winner, Bela Zaboly and writer Tom Sims. With the comic strips were articles about the animated cartoons produced by Paramount Pictures and why Popeye’s nemesis was called Bluto and later Brutus. Popeye has a Facebook page dedicated to his Italian fans at Quelli che vogliono di nuovo Braccio di Ferro in edicola. His Italian comic book adventures have been catalogued at the site “Avventure di Pugni e Spinaci” (see >> ), managed by Popeye fan Gaspare Pero. Buon 90 ° compleanno Braccio Di Ferro!